I do not, by any means, think I’m out of shape. And that’s not to brag or to make you think that I am the epitome of fitness—it’s to put into context just how unbelievably hard and taxing the sport of rowing is, and why I give the utmost respect to the athletes who travel in for the annual Head of the Charles Regatta. Just in time for the big event, the kind folks at Community Rowing, Inc invited me to join some of their coaches and staffers for a tour of the course, as well as a stint in a four-person boat, or shell, to learn a little bit about what it feels like to be on the water. Mind you: Most people who go through CRI’s Rowing 1 adult class don’t even get out onto the water until their second or third lesson, and even then, they’re locked into a barge that doesn’t move. 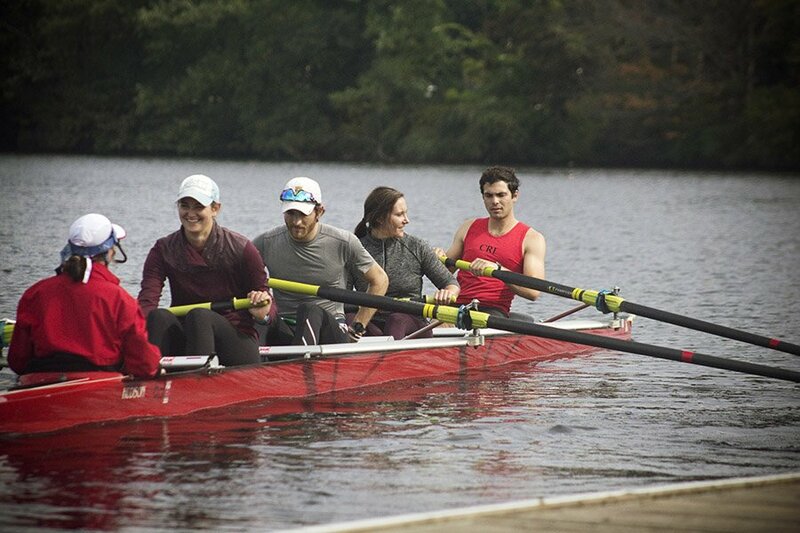 I would be rowing the Charles River at my first lesson. But I was game to give it a try. Luckily, I didn’t actually have to row the entire course, because let me tell you…that thing is a beast. The course spans a little over three miles, boats have to maneuver six bridges, and the unpredictability of New England weather plays a huge role. As we cruised down the Charles, we came upon the infamous Eliot Bridge, where the hairpin turn is, and where, not coincidentally, most collisions occur (aka a great viewing spot). The staff explained to me that this race is considered a coxswain’s race–meaning, it’s largely dependent on the line, or race course, the coxswain, the person in charge of steering the boat, chooses. Because the teams don’t all start at the same time, victory is less about beating out the person next to you and more about finding the most optimal route that covers the least amount of distance. It’s all about teamwork and strategy. And then it was my turn to try my hand at it, so we prepared a four-person shell for the water. Wondering why you have to prepare a boat? Well, you need to carry it down to the water—it’s not already floating around there. Despite the fact that the shell is surprisingly light, even carrying it down there was methodically coordinated by the coxswain. We carried it upside down on our shoulders, or for those of us short in stature, we pretended, but it was all very much a team effort. Even my blundering confusion couldn’t throw off the three other crew members. To place the boat in the water, we held onto either side of the shell and flipped it over, placing the belly of the boat gently on the water while standing on the dock. We slid off our shoes, affixed our oars on opposite, and alternating, sides of the boat, and two-by-two, began hopping into the shell. “Port side, step in!” The coxswain instructed. All of her instructions came through a device called a cox box, which is a headset that feeds into speakers located throughout the boat, so that rowers can hear instructions above the ambient noise of the river. I looked around, confused, then realized port side was me—it means left side, and also the side your oar is on in relation to the direction the coxswain is facing. Once in, I was instructed not to step on the bottom of the boat but on the narrow seat, and slid my feet into sneakers that looked like something a clown would don. They were red and large, sized for all feet, and securely fastened to the boat like the straps on a rowing machine, so my feet would stay in place while my body moved. I was sitting in the second-to-last position with two coaches and nationally competitive athletes in front of me and another coach directly behind me—talk about intimidating. After a short rowing 101 lesson on the dock, we pushed off. I wasn’t in the stern (the back of the boat), so I kept my oar gently gliding on top of the water and watched their powerful strokes carry us through the water. 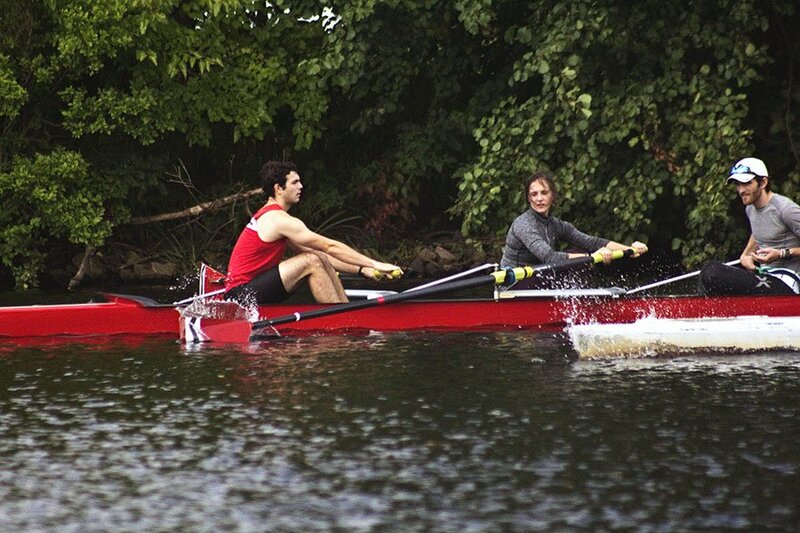 “Both rowers in the bow: ROW! ROW! ROW!” I craned my neck to look at the coxswain who was in front of me, but obscured by my two teammates, to make sure this meant me. It did. It was my turn to row. Oh no, I thought. I’m not going to get this right. The coordination may be a lot more complicated than a rowing machine, but the shell’s seat is designed just like it—you’re just on the river. The narrow, unpadded platform is on a track, and with each stroke in the water, your seat moves forward and then back with you to create a forceful push through the water. It’s easy to see now how many people get their rowing form wrong in the gym, but you can’t have bad form on the water, or else you won’t go anywhere and your exertion will be wasted. You begin with your knees bent and with the oar behind you. Once it’s in the water, you push off the platform with your legs and finish through with your arms—but the coordination and timing with your teammates has to be perfect, or else the long oars hit each other and you won’t go anywhere. Rowing in twos made my inaugural journey easier: The teammate behind me had to coordinate with my strokes, but I didn’t have to worry about coordinating with anyone in front of me. And I had to remember to breathe. I was impressed by the way the other rowers made it look so effortless. Everyone moved together like a well-oiled machine. Granted, we were on the water for about 10 minutes, but I can’t even imagine the stamina needed to carry yourself through a full practice, or race. Needless to say, I’ll be in attendance the weekend of October 20 to watch world-class athletes make it happen.